These are stitch patterns such as might be found in a stitch dictionary. They are not a pattern for a finished object. You will need to add selvedges or some other form of knitted stitches to either side. The decreases in row 1 vary between version 1 and version 2. Version 1 is shown at the bottom of the swatch; version 2 at the top. The place where the two meet has an interesting variation just because of the way different stitch patterns, even coordinating ones, can interact at that kind of boundary. 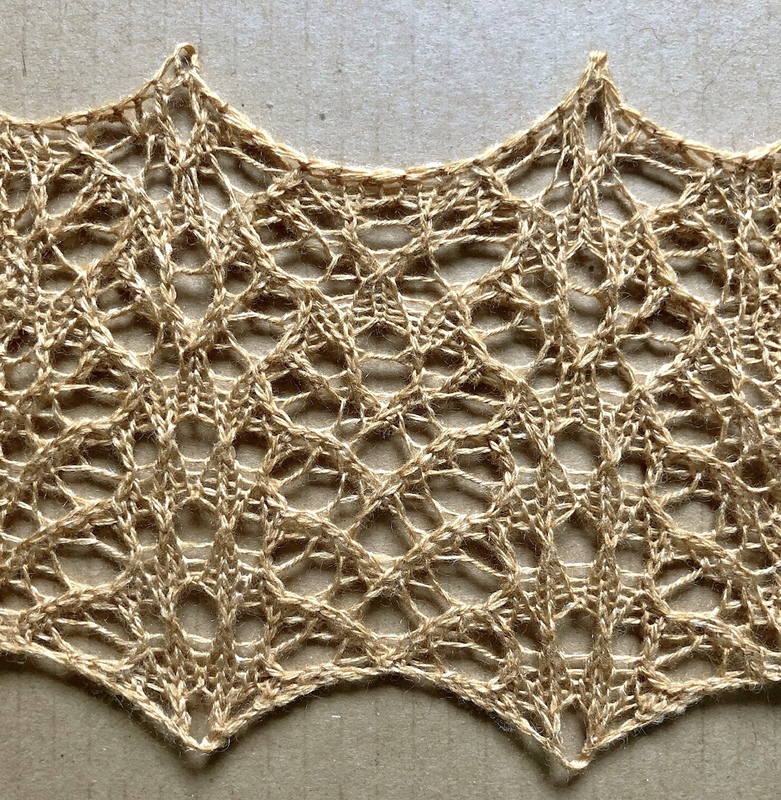 Bees is a multiple of 16+16 stitches and either 6 or 12 rows, depending on the version. My blog posts and free stitch patterns are supported by subscriptions on Patreon or donations to my Paypal tip jar in the sidebar. If you appreciate my work, please consider helping out. Thanks! Row 1 (RS): k1, yo, ssk, k1, k2tog, yo, ssk, *yo x 2, k2tog, yo, ssk, k1, k2tog, yo, k2, yo, ssk, k1, k2tog, yo, ssk; work from *, yo x 2, k2tog, yo, ssk, k1, k2tog, yo, k1. Row 2 (WS): p7, (k1, p1) in double yo, *p14, (k1, p1) in double yo; work from *, p7. Row 3: k2, yo x 2, sk2p, k3, *k3, DSD, yo x 2, k1, 1/1 RC, k1, yo x 2, sk2p, k3; work from *, k3, DSD, yo x 2, k2. Row 4: p2, (k1, p1) in double yo, p4, *[p4, (k1, p1) in double yo] twice, p4; work from *, p4, (k1, p1) in double yo, p2. Row 5: yo, ssk, k1, yo x 2, cdd, k2, *k2, cdd, yo x 2, k1, k2tog, yo x 2, ssk, k1, yo x 2, cdd, k2; work from *, k2, cdd, yo x 2, k1, k2tog, yo. Row 6: p3, (k1, p1) in double yo, p3, *p3, (k1, p1) in double yo, [p2, (k1, p1) in double yo] twice, p3; work from *, p3, (k1, p1) in double yo, p3. Row 1 (RS): yo, k2tog, yo, ssk, k1, ssk, yo, k1, *k1, yo, k2tog, k1, k2tog, yo, ssk, yo x 2, k2tog, yo, ssk, k1, ssk, yo, k1; work from *, k1, yo, k2tog, k1, k2tog, yo, ssk, yo. Row 3: k3, DSD, yo x 2, k1, *1/1 RC, k1, yo x 2, sk2p, k6, DSD, yo x 2, k1; work from *, 1/1 RC, k1, yo x 2, sk2p, k3. Row 4: p4, (k1, p1) in double yo, p2, *p2, (k1, p1) in double yo, p8, (k1, p1) in double yo, p2; work from *, p2, (k1, p1) in double yo, p4. Row 5: k2, cdd, yo x 2, k1, k2tog, *yo x 2, ssk, k1, yo x 2, cdd, k4, cdd, yo x 2, k1, k2tog; work from *, yo x 2, ssk, k1, yo x 2, cdd, k2. Row 6: p3, (k1, p1) in double yo, p2, (k1, p1) in double yo, *p2, (k1, p1) in double yo, p6, (k1, p1) in double yo, p2, (k1, p1) in double yo; work from *, p2, (k1, p1) in double yo, p3. Row 7: k1, yo, k2tog, k1, k2tog, yo, ssk, *yo x 2, k2tog, yo, ssk, k1, ssk, yo, k2, yo, k2tog, k1, k2tog, yo, ssk; work from *, yo x 2, k2tog, yo, ssk, k1, ssk, yo, k1. Row 9: k2, yo x 2, sk2p, k3, *k3, DSD, yo x 2, k1, 1/1 RC, k1, yo x 2, sk2p, k3; work from *, k3, DSD, yo x 2, k2. Row 10: p2, (k1, p1) in double yo, p4, *[p4, (k1, p1) in double yo] twice, p4; work from *, p4, (k1, p1) in double yo, p2. Row 11: yo, ssk, k1, yo x 2, cdd, k2, *k2, cdd, yo x 2, k1, k2tog, yo x 2, ssk, k1, yo x 2, cdd, k2; work from *, k2, cdd, yo x 2, k1, k2tog, yo. Row 12: p3, (k1, p1) in double yo, p3, *p3, (k1, p1) in double yo, [p2, (k1, p1) in double yo] twice, p3; work from *, p3, (k1, p1) in double yo, p3.